"I will love you and honor you all the days of my life." ,God made an eternal promise to his people. In the Sacrament of Marriage, that same type of promise, called a covenant, is made between a man and a woman. Congratulations to you and your beloved if you have decided that sacramental marriage is the next step for you. To be married in the Catholic church, it normally requires meeting with a priest or deacon, participating in some marriage formation programs, and having your wedding inside a Catholic church. In order to be married in a Catholic church, one person in the couple must be Catholic, but it is not necessary that both are. The priest or deacon will assist you with making decisions appropriate to the baptismal and religious status of the couple. Please contact the parish office at least 6 months before your intended wedding date. Once you have met with the Presider of your wedding and freedom to marry in the church has been confirmed, a date can be set. It is advised to not reserve the venue for your reception until you have a confirmed wedding date with the church. If are currently married, but the marriage did not take place in a Catholic church or chapel, or was not celebrated by a Catholic priest or deacon, but you would still like to have your marriage blessed by the Catholic church, please contact Fr. Satish about the process known as convalidation. If you are in need of declaration of nullity, please contact Mel McWilliams to be connected with an advocate. 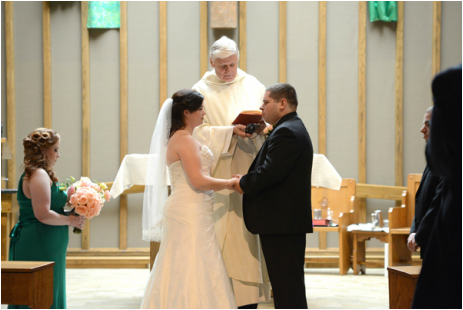 Exchange of vows during a Catholic wedding.